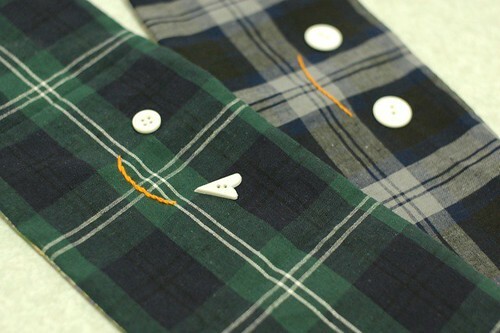 I made them with narrow width cotton. I just cut them and sew each forming a circle. It's very simple and easy to dry. In the past, people made them with their used cotton kimono. I also made covers for toilet papers. I made only a rectangle with snaps. It's so simple and easy to sew. I put them at the small window in the bath room. Now I'm making a baby quilt and a Kimono style underwear. When I sew, Tomato moves a lot (* v *). This picture is my husband. We attended at a class for a couple expecting a baby. He put a heavy vest to know how pregnant woman feels. I went the class for four times and learned how to prepare for my delivery. Thank you very much for your comments. I'm happy to read them (* v *). hahahaha ... very nice to see husband 'pregnant'. Happy you both are preparing well for parenthood. Love your sewing skills and thanks for sharing. would you mind explaining how these Japanese diapers work? We also have cloth diapers here in Germany, but they are not sown into a circle. Your husband looks really funny, did he enjoy the course? It's so good to see you posting again! ...and of course your tomato is dancing in your uterus when you sew. He/she is a happy baby when you do what you love so much!! I'm happy listened news for you about your craft and your life..
We used to have the same diapers in Venezuela (minus the sewing in circle or the cute bears). My mom gave me a dozen or so of those diapers for my daughter sixteen years ago but I never used them. Your baby is lucky to have you as mom! Love the diapers!In my country cotton diapers were very popular in the past and now I've heard new moms return to them! Yours are just gorgeous! Hi Mai, I think Tomato moves so much when you sew because he is very excited to see what you are making! Those diapers look very smart, but I still don't get how you are using them. Inside the kind of little pant you showed too? Love your husband in the vest, that is a smart idea to get them to feel how being pregnant is. 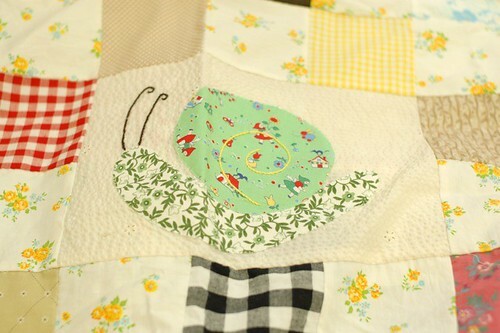 The baby quilt looks very lovely! Tomato must love the noise of the sewing machine! You worked quite a lot!!!Kisses!!! The quilt you are making is very cute! Do you know what you will name the little tomato? Oh the nappies look almost as good as your husband! Not sure how either work though - would love to know more about both working! Enjoy stitching for your tomato- so many little reminders before and after and for ever. Oh my.... My MIL made me diapers exactly like those, except they were puppy dogs. They were wonderful diapers. I still have some of them and now that baby is 25 years old! In Japan I went to 母親学級. I think maybe now the father also attends? I love everything you sew. And to Charlotte--the beauty of these diapers is that you can fold them different ways, kind of like origami, to use them! I can't wait to see how you put these diapers on your little tomato. No pins necessary? I'm wondering, like many others, how they go on the baby. Ah, I understand now. You fold them in half and then put them in the diaper cover, which holds them on the baby. I saw these in a Japanese baby book but didn't quite understand how they were used. Cloth diapers in the US are either large squares that you fold into a rectangle, or thick layers that are already stitched into a rectangle shape. We use the diaper covers as well to hold them in place, although years ago people used large safety pins to pin them on each side at the baby's waist. Love the baby quilt. Enjoy the journey to motherhood! It is so thoughtful that you made cloth diapers for your Tomato. You can't see them in my country, people simply buy disposable diapers - they say it's faster and don't have to wash them later. But I think you are showing your love to your baby making all kind of clothes for him/her. Looks like you've settled into the new place already.. when's delivery? 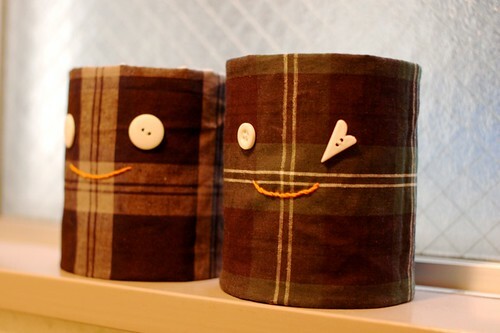 Oh and I like the toilet paper cover, hehe such a clever idea!! Hello Mai, hahahaha!!! what a great husband you have. I love how you sew everything by hand. I hope you will post on how you use these Japanese diapers. Glad to see you again. It's beautiful what you said about your baby moving while you're sewing! For sure Tomato can feel you are soooo relaxed that he feels great, as well. Oh! I'd also like you to explain how do Japanese diapers work! Take care of yourself and little Tomato! my parents used that kind of diapers on me too. In those days disposable diapers are still a luxury and water bills are cheap. nice website. I fell in love with it first time I see this site. It is adorable and quaint. I've posted your Sarubobo post! (if you don't mind) ...I've made one of this, I found it really nice!! Thank you for the inspiration!!! So glad you're posting again. I enjoy your blog very much. 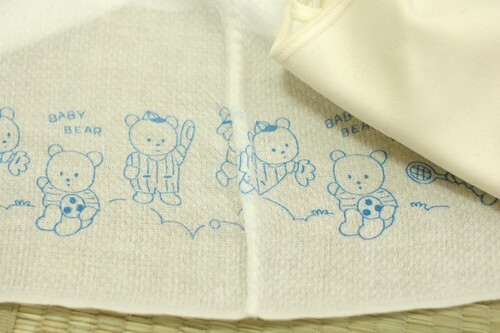 I'm curious about the cloth diapers... they look rectangular, but you say they are sewn in a circle? We use diapers like these in a rectangle shape for our little ones. The hanger is interesting, too. A drying rack? I loved to see your pregnant husband! So cute!! Thank you for sharing the pictures! I loved the snail. Thank you for showing. I used cloth diapers (rectangular folded up) on each of my nine babies and then a velcro polyester or nylon cover. I made a few all-in-one diapers too. I'd love to see one of your dipes folded on your sweetie later. 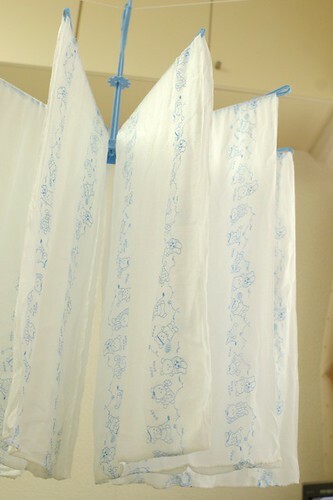 Your dipes, and the tissue covers are CUTE! Oh, such a blessed time! Thank you so much for showing your newest projects -- especially the diapers! Can't wait to see the kimono style underwear. It's wonderful to learn how other countries use cloth diapers. When I have a baby, it is what I want to use, too! Your husband is such a good sport for wearing the pregnant belly. Did you enjoy the class? It is lovely to see you posting again. I have missed you. Tomato is so lucky to be having you for a mother. Those cloth nappies are just so cute! Did you mean you sewed around the four sides of the nappies? Your husband is a good man letting you take his photo to post. I have never seen a vest like that before. He is so caring to you and tomato. I'm so excited to see your little tomato.She/he is so lucky to have you and your husband as her/his parent.Your husband looks so cute in that vest. Oh - I am so interested in the diapers...I can't wait to start sewing for my tiny mame-chan once the morning sickness has stopped and I feel normal again! I love your sewing. 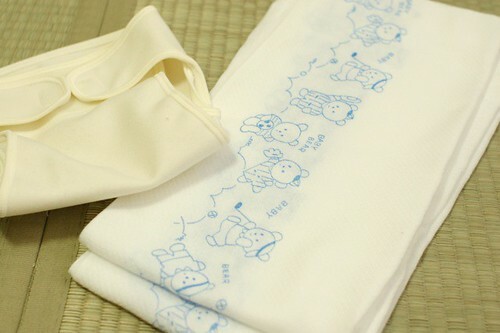 :) Did you buy the outer cover for the diapers or make it? Those diapers are gorgeous and the baby quilt is perfection. You are so gifted! 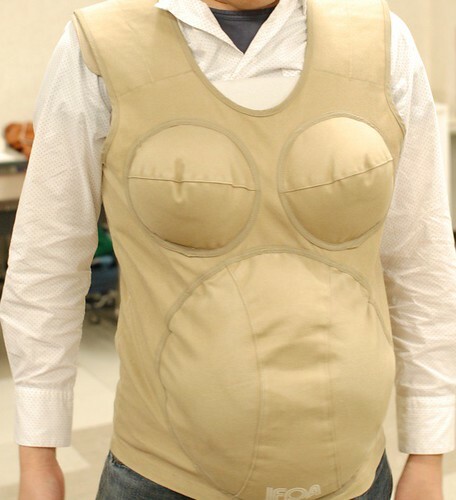 Your husband looks so adorable in the pregnancy vest! It is sweet that he was wiling to try it. My husband and I took a pregnancy class about changing diapers and swaddling, and my husband was the only man in the class who would practice on the baby doll - the other men thought they were too cool. They will have to learn later with real dirty diapers! Haha! Thank you for writing, I love your blog! Oh my gosh he's gorgeous! very nice/wonderful baby-blanket you made. i had no idea what these where when i found a lady selling a whole box full of them at a markets for just 5cents each (australian) i bought some for my daughter to use as blankets for her doll as they were so cheap. cloth nappies (diapers) are usually made of a square of towelling in Australia and held on with pins or special rubber grips, folded in many different ways to suit your child (age, size etc). cloth nappies are very popular again now, even here in Aus. I like your blog, lots of informative information. I think I will recommend this to my friends. wow.. that was a great thought then.. Yeah every web designers have gone through with that. Quite effective info, lots of thanks for the article.